A focus on intergenerational inequalities risks side-lining the importance of other inequalities, including intragenerational, and may lead to the misjudged policy solutions. The Resolution Foundation’s Intergenerational Commission began this week with some headline grabbing recommendations from their two-year work programme: boosting funding for technical education; replacing council tax; bringing part time workers into auto enrolment; and, most notably, providing a £10,000 ‘Citizen’s Inheritance’ for all 25 year olds. As eye-catching as some of these idea are, they rely on a central idea which obscures many of the complexities of societal inequality in the UK today. By focusing on the inter-generational angle and funding £10,000 pay-outs to 25-year olds at the same time as levying National Insurance on those aged 65+, the Commission is using a block assumption that all pensioners are wealthy enough to be taxed to support re-distributive policies. Although there have been great strides made in reducing pensioner poverty over the past 20 years, this has flatlined and there are still significant pockets of pensioner poverty. To view inequalities as simply being a case of young = poor, old = rich is to ignore the significant dynamics of intragenerational inequalities. 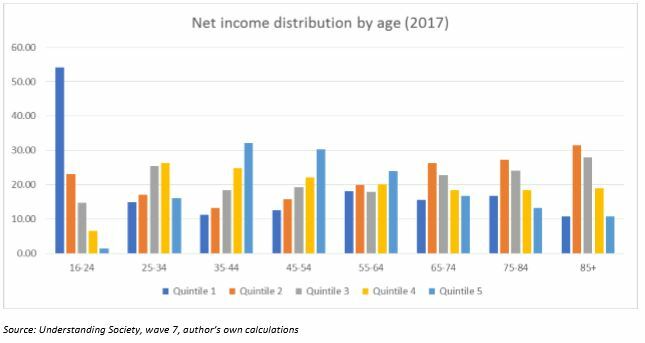 Looking at the above chart, one is instinctively drawn to that fact that over 50% of those between the ages of 16-24 are in the lowest fifth for net income in the UK. However, this conceals how many in this age group are in education or who have just started their careers. A more interesting finding is that a high proportion of people over the age of 65 are in the lowest two quintiles of net income. This represents just over 5 million adults over the age of 65 who have net incomes in the bottom 40% of people in the UK. income are not perfectly correlated and so designing policy on the back of this risks exacerbating existing inequalities. Rather than being based on an arbitrary measure of age, policies based on income are more likely to have an impact. Another of the Intergenerational Commission’s suggestions, a “lifetime receipts tax”, does just that, by using inherited wealth as the basis for raising money, rather than age. Blanket payments for 25 year olds however play into the narrative of intergenerational inequalities being the ones that matter most, and do not address underlying structural problems, such as access to housing or education – problems which are to some extent felt by all. These broader problems could, in part, be addressed with the money intended to be raised for the Citizen’s Inheritance. Ultimately, we must stop assuming generations are in conflict with one another. If re-distribution is necessary, it must be from those who can afford it, to support universal opportunities, so that everyone has the chance to improve their lives and to make the contributions the UK economy needs as it faces an uncertain future. Dean Hochlaf worked with the ILC from May 2016 to September 2018, when he joined the IPPR.